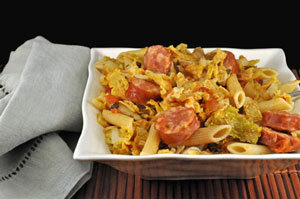 Pasta, Cabbage, Sage, Sausage, Thyme for Cooking easy gourmet one-dish dinner. This is one of my favorite recipes with cabbage. When, buying a cabbage is a commitment. One has to have a few recipes to use it up. Shred cabbage - cut wedges off the cabbage, lay flat and cut in fine strips with a sharp knife. Roughly chop tomatoes - reserving all juice. Slice sausages into 1" (2.5cm) pieces. Heat oil in large nonstick skillet over medium-high heat. Add paprika and sauté 1 minute. Add onion, garlic and cabbage and sauté 10 minutes or until starting to get tender. Add sausage and sage and sauté 5 minutes. Add tomatoes and their juices, turn heat to low, cover and simmer 20 minutes or until cabbage is done. Uncover, turn heat up and stir in vinegar. Add drained pasta and toss to mix well. Heat through and serve.